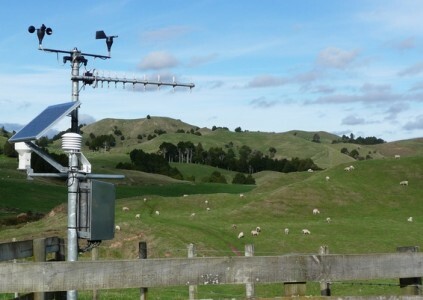 Monitoring environmental conditions allows farmers and growers to have more control over the risks they face due to the weather, as well as manage inputs such as irrigation, fertilisers or sprays. 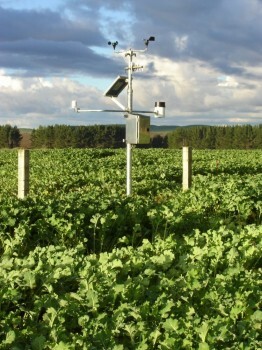 Systems can range from a simple rain gauge to a fully featured agricultural weather station with data automatically uploaded to the web. Commonly used sensors measure soil moisture, soil temperature or rainfall while comprehensive systems are able to calculate values such as Potential Evapotranspiration and Growing Degree Days. Specific applications include the use of soil moisture to manage irrigation, recording (logging) of flow meters and monitoring of wind speed and delta T for spray operations. Scottech has been involved with monitoring water use for many years, firstly to promote more efficient usage for both cost saving and crop productivity, and secondly, to provide information to irrigators on their consent compliance status. The award winning flow logger was developed in close partnership with Regional Councils to meet increasing demand for reliable accurate information on water takes. These measure volumetric water content, and with user input data, can calculate Soil Moisture Deficit in mm. When used at the crops rooting depth, they give a very accurate measure of the amount of water available for plants. Growers can then use this information, in conjunction with their own knowledge of their particular crop and soil conditions to build up an accurate picture of crop irrigation requirements. This knowledge can add significant value and frequently leads to reduced irrigation use, reduced costs, better quailty production and reduced exposure to moisture related crop diseases. PET is calculated from local weather station data using a complex algorithm combining readings of wind speed, temperature, humidity and solar radiation. Normally this is automatically calculated by the weather station datalogger so that the user can get PET in mm per day. This can be combined with information on rainfall and irrigation to give an indication of your local water balance. Flow loggers are attached to flow meters and are set up to record how much water is used for irrigation. While these are primarily installed by users who are required to use them for consent compliance, they offer much more in the way of information for the irrigation manager. Scottech's Flow Logger has been designed with this in mind, with a large display which allows the irrigator to instantly see current and cumulative water use without the use of a computer. There are models for both manual download and automatic download via telemetry. Timely alerts of weather conditions are critical to many applications. Scottech were the first in New Zealand to offer a simple Frost Alert that utilised cell phone technology that would make a phone call to growers to alert them to frost conditions, and avert massive crop losses.The XISYS Frost Alert replaces the original and provides growers with text or dial alarms to multiple phone numbers. For more complex alarming applications, we can integrate alarms into weather stations or other monitoring systems, that can be triggered on any measured condition. Alarms can be audible, visual, phone calls or text messages. Many of the weather stations on telemetry are also able to provide alert systems, either by programming the station or installing an autodialler.